This set consists of 16 handpainted Urban terrain Tiles. 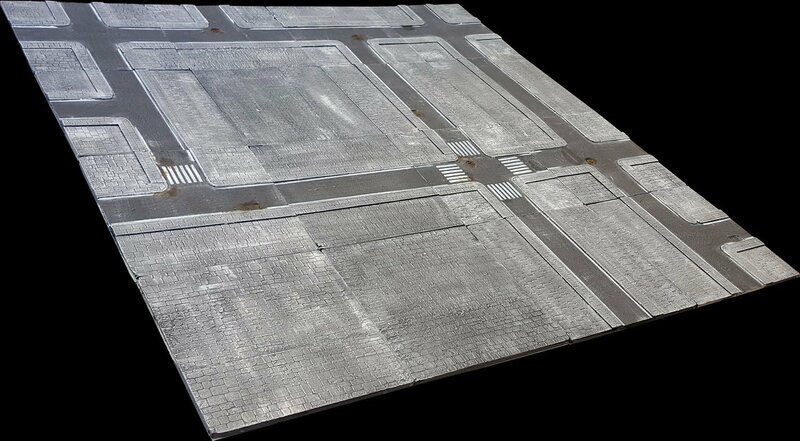 These 30cm x 30cm (1'x1') Tiles connect magnetically and can be configured to create any Urban board. They come in 3 distinct themes: "Rustic", "Medieval" and "Modern" which cover a wide range of Urban environments and gaming themes. You can arrange them to simulate hundred of street layouts to fit any size of playing area, to suit each of your games. And, since they take up minimal space, you can store them in a small living-room cupboard. This is one of the Base Sets. You have to pre-order a Base Set before adding any more tiles and/or base sets in your order. Not in stock - this is the pre-order the Pedion "City" 4'x4' Urban Battlefield Set; this is the equivalent of the same Kickstarter Reward level, to be delivered in April 2018.